Chinese motorists' preference for new-energy vehicles (NEVs) and sport utility vehicles (SUVs) is well-known, and it has driven solid growth momentum in those segments in recent years, but a new trend seems to be gaining traction. At the 2017 Guangzhou Auto Show, which kicked off in South China's Guangdong Province on November 17, the preference for NEVs and SUVs remained intact, evidenced in carmakers' continued focus on those areas at the weeklong show. However, talk of Internet-connected cars, or smart cars, consumed much of the attention. "I think the biggest topic at this year's Guangzhou Auto Show was Internet-connected cars and intelligent cars. We don't talk about cars like we have always done, we talk about them more like devices that you can drive as well as connect to your smartphone or the Internet," said Wang Xin, who runs an influential online auto news site known as Auto Prophet. Wang, who has been covering the Chinese auto industry extensively in the past few years, told the Global Times on Tuesday that almost every car company, domestic or foreign, that he covers were talking about Internet-connected cars. At the Guangzhou Automobile Group (GAC)'s stand at the auto show on Friday, a model of the company's popular Trumpchi car attracted many spectators. The car uses the latest technologies from Internet giant Tencent Holdings, which enable the vehicle to follow voice commands to do everything from rolling up or down the windows to sending messages to finding a parking spot. GAC and Tencent agreed in September to collaborate on Internet-connected cars with Tencent providing its robust technological capabilities in areas such as big data, cloud computing and artificial intelligence (AI). On November 16, just a day ahead of the official kickoff of the Guangzhou Auto Show, at a lavish press event attended by executives of the two companies, local officials in Guangzhou and hundreds of reporters, GAC and Tencent debuted an Internet-connected intelligent car named iSpace based on a Tencent "AI in Car" system. "The fact that GAC and Tencent took only two months to achieve such results in the intelligent and Internet connectivity areas reflects the close coordination and great effectiveness of the cooperation," Feng Xingya, general manager of GAC, said at the event. GAC is hardly the only carmaker that showcased Internet-connected cars. Dongfeng Yueda Kia Motor Co, a joint venture among China's Dongfeng Motor Corp, Yueda Group and South Korea's Kia Motors, debuted an Internet-connected, intelligent SUV called NP. A China-only model will be launched in 2018. The company also launched a new version of the Kia Forte, which is the company's first car to carry Baidu Inc's voice-based vehicle interaction system DuerOS, which enables connectivity among the driver, the car and the Internet, Dongfeng Yueda Kia Motor said in a press release. 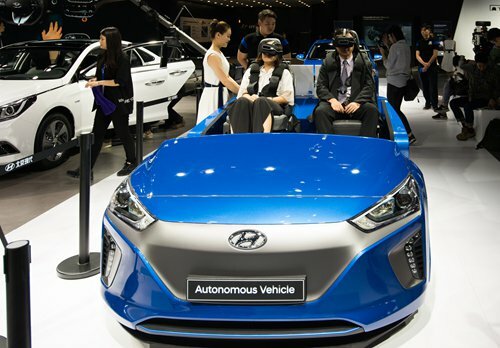 Baidu and Hyundai Motors, the parent company of Kia, announced a joint plan to develop Internet-connected cars based on Baidu's Internet technologies. Also at the Guangzhou event, several other carmakers, including SAIC Motor's brand Roewe, showcased new models with features such as Internet connectivity and intelligent driving, while others were talking about their strategies in those areas. "Even those who don't have any new models to show here like to talk about how they are focused on Internet-connected intelligent cars and how much they are going to invest in the area," an industry expert, who would only give his surname as Li, told the Global Times on November 17. "I guess it's a new trend after we heard so much about NEVs and SUVs and how fast they have been growing in the past few years," said Li, who claimed he had heard "enough talk of Internet connectivity and intelligent driving for one day." Behind the carmakers' and Internet companies' push for Internet-connected intelligent cars is a massive base of consumers who want their cars connected to their smartphones and the Internet, experts said. News site chinanews.com reported on September 23, citing data from the China Automotive Technology and Research Center, that the number of consumers of intelligent Internet-connected cars would reach 40 million by 2020 and the market size would reach 400 billion yuan ($60.3 billion). Apart from the Internet-connected and intelligent car trend, other changing tastes and trends in the world's largest auto market such as higher demand for quality have also led to adjustments by many carmakers. Changan Ford Automobile Co, the joint venture between China's Changan Automobile Co and US-based Ford Motor Co, has remained quiet on its product offensive and focused on improving quality and customer services, according to President and CEO Nigel Harris. "It's been very quiet this year and it's going to be a bit quiet next year. What we're doing is to use that time to make sure that our services to customers and the work we have done on quality improves," Harris told reporters on the sidelines of the Guangzhou show on November 17. Harris said the rationale behind that strategy was that Chinese consumers and the market have changed greatly in the past decade since he arrived in China in 2007. "Here is my point: The Chinese customer and the automotive industry have matured incredibly fast over the 10-year period," Harris added, noting that Chinese consumers are increasingly paying attention to quality and service. Meanwhile, Changan Ford is committed to the electrification of its product line. Harris said the company is going to basically electrify its whole fleet in China by 2025. The company launched a plug-in hybrid model of the Mondeo, the first of its electric vehicles. At the Guangzhou Auto Show, NEVs and SUVs continued to take center stage, where several companies, including Volkswagen AG, unveiled their own plans for the NEV and SUV segments. Volkswagen said it would work along with its local partners to invest about $12 billion by 2025 in developing electric cars for the Chinese market. Also, the company said in a statement sent to the Global Times that it would make 2018 "a year of SUVs" and bring at least four new SUV models to the Chinese market. Wang of Auto Prophet said the Guangzhou Auto Show, one of the largest in the nation, which comes at the end of the year, has become a stage for both winners and losers of the year. "For winners, they need to show how successful they were this year and for losers, they need to show that they are still in the game; So there is not much substance coming out of it," he said.